Here you have a Photoshop header Template for Twitter header image for accounts with multiple members. You just have to open the PSD file and put your background image (1252 x 626, 2:1 aspect) and your avatar images for each member. 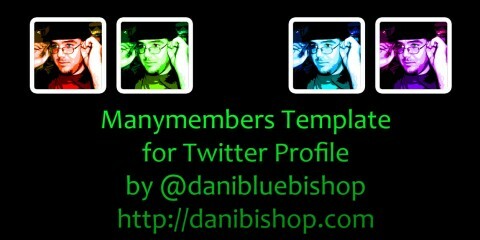 The template for the header is fixed for 4 avatars plus the central one, which is the avatar of the Twitter account. You can see how it looks at this twitter user, (Versión Española Experience), Maceto’s or the profile for Braintown spongy aliens, the cerebronians, for example. You can use this template for free and share it, as long as you don’t claim it as yours and you don’t charge for it. This is a free (as in free beer and free speech) template. If you use this template, please, let me know! Send me a tweet or an email! If you found any bug, fix or improvement, tell me! tell me! TELL ME! You can sign up to the newsletter for more future templates, tools and useful and simple stuff for programming and design. Thanks for visiting and happy use!